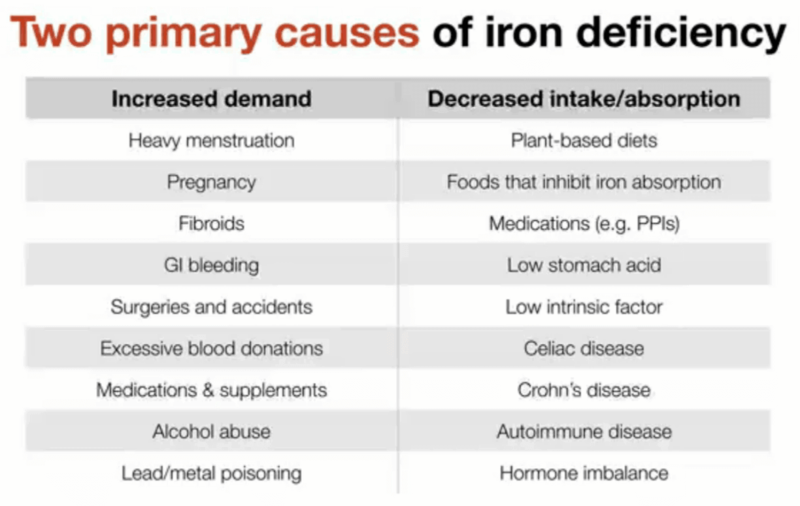 Iron is an essential nutrient, but too much iron can lead to a number of chronic diseases, while too little iron can lead to many acute symptoms with the number one symptom being fatigue. 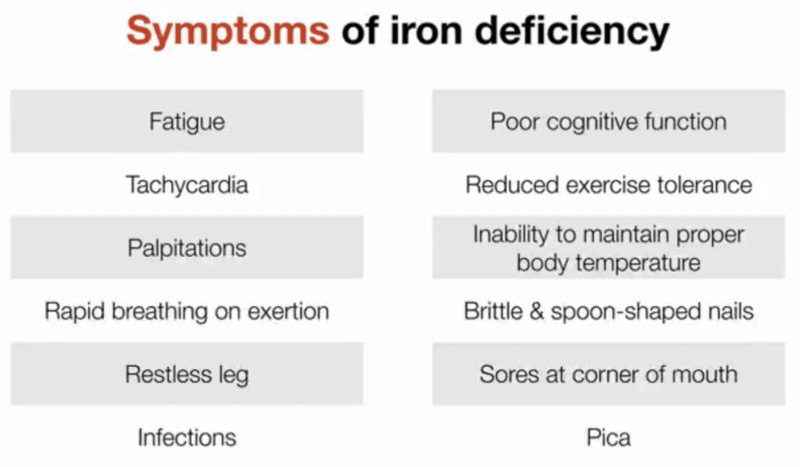 Many people suffer either from iron overload which generally speaking affects more men then women, or iron deficiency which generally speaking affects more women and children. 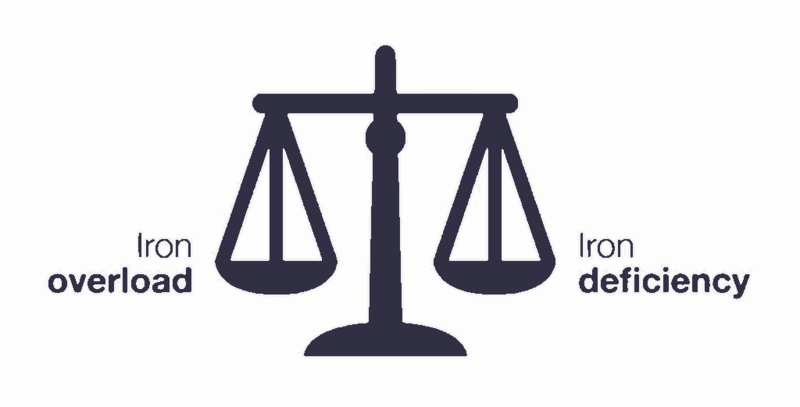 Finding the right balance is important, and because the symptoms of excess iron and iron deficiency can be similar, or related to many other health conditions, the only way to accurately know how your iron levels are is to do an iron studies blood test. An iron studies blood test will measure iron, total iron binding capacity, transferrin, transferrin saturation and ferritin. We will talk more about these later and the optimal ranges for good health, the optimal range is different to the lab range that you will find on a blood test. 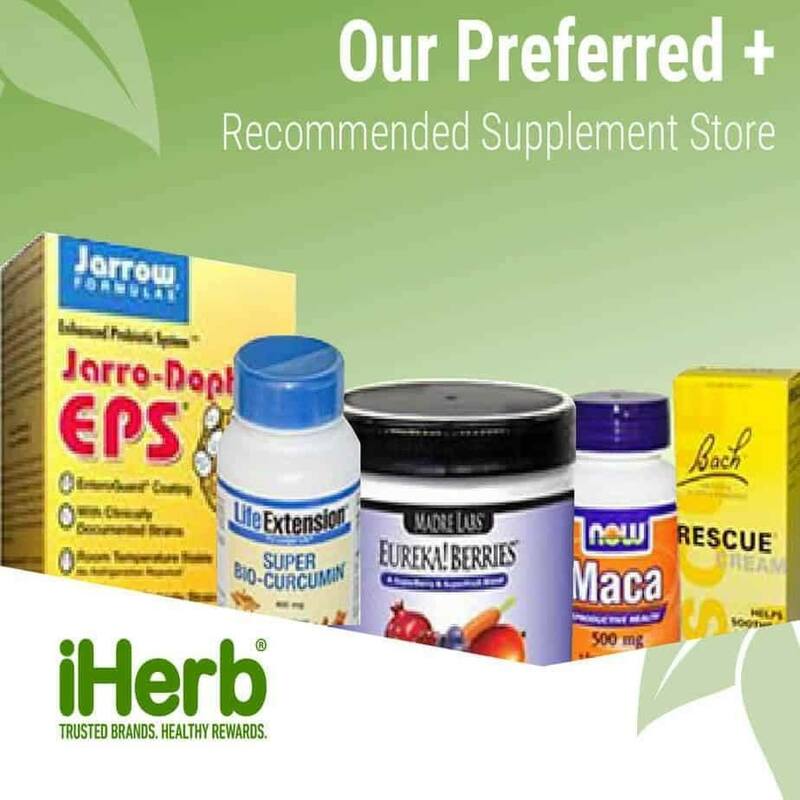 Iron is particularly important in childhood and pregnancy, as the developing baby depends solely on the mother’s supply from her diet, many common pregnancy multivitamins contain ferrous fumarate which is a poorly absorbed form of iron. Elite athletes and weekend warriors are both at risk for iron deficiency if doing endurance sports, because of an increased demand for iron, and an increase in iron loss through sweat and even gastrointestinal bleeding. For women the biggest cause of an increased demand for iron is the menstrual cycle and pregnancy, especially during the reproductive years. As women approach menopause heavy periods and fibroids can cause iron deficiency anaemia, and for the elderly a low intake of nutrient dense foods, low stomach acid are the biggest cause of iron deficiency. For men the biggest cause of an increased demand for iron is gastrointestinal bleeding, accidents and alcohol abuse. As men get older low intake of iron rich foods and gastrointestinal bleeding are the main causes of iron deficiency. The most common reason for a decreased intake are people who are following a plant based diet, this is mainly because plants contain non-heme iron which is absorbed at less than half of animal based heme iron. Plus many plants that are rich in iron also are high in phytic acid which also decreases the body’s ability to absorb iron. 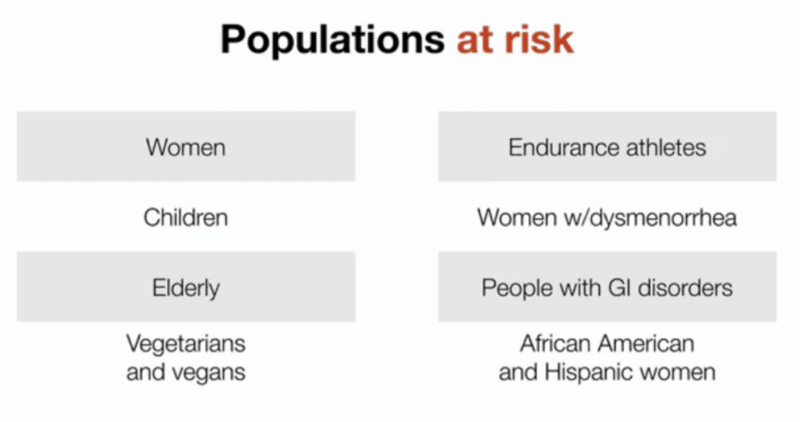 I have a lot of respect for people following a vegetarian / vegan diet for ethical or religious reasons and I would not want to discourage people from doing that, but it is important that they get an iron studies test each year at a minimum to make sure they have optimal levels of iron. Digestion problems and medications like proton pump inhibitors (use to treat reflux and one of the most overprescribed drugs) are a major cause of reduced iron absorption. In these cases addressing the cause of the iron deficiency is the first step in restoring optimal levels, rather than just taking a supplement. An iron studies test is the best way to measure iron deficiency and while it gives you the blood level of iron, the two best markers of iron deficiency are Ferritin and Transferrin Saturation. Ferritin is a protein synthesized by the body that is mainly used to store iron for future use, it is considered the most sensitive marker for iron deficiency. Ferritin is often the first marker to drop below the optimal range and can be an early indicator of inadequate iron levels. Ferritin is also an acute phase reactant that increases whenever there is inflammation in the body, so in some cases relying on ferritin as a marker for iron deficiency can be a bit misleading as the ferritin maybe falsely elevated by inflammation. A good way to measure if the ferritin is elevated, or in the normal range because of inflammation is to also test HsCRP which is an inflammation marker and HbA1C which measures the glycation of red blood cells and is increased during times of inflammation. Transferrin saturation measures the amount of transferrin in red blood, transferrin is the main transport protein of iron. Optimal transferrin saturation levels are between 30-40% and this helps to transport the the iron to all of the tissues, vital organs and bone marrow so normal metabolism, DNA synthesis and red blood cell production can take place. Absorbed iron that is not needed for these purposes is stored as ferritin. Hemoglobin enables the red blood cells to transport oxygen through the bloodstream, if hemoglobin levels are low as well as ferritin and transferrin saturation that means you have iron deficiency anemia. Low iron is not the only cause of anemia, and you can have low iron without anemia, this is another reason why testing is important to find out the cause of anemia. B12 and Folate are cofactors for iron absorption and I would always recommend checking these levels when assessing your iron status. Diet is always the first treatment of choice when treating iron deficiency, along with addressing the underlying cause of why the iron deficiency occurred in the first place. Heme iron found in animal products is much better absorbed than non heme iron which is the plant form of iron. The highest sources of heme iron are clams, liver, oysters, mussels and venison, these are all foods that are not commonly consumed in the standard diet. Lean red meat does contain iron but clams are 7X richer in iron than red meat and liver is 3X richer in iron than red meat. I understand not everyone likes the taste of liver, but it can easily be mixed into stews or burger patties so that you would not even know that you are eating it. If your not a fan of liver then 2-3 servings of clams, oysters or mussels a week will really help to boost your iron levels. Non Heme iron is found in plant based foods, and the body’s ability to absorb non heme iron is inhibited by phytic acid, oxalic acid, coffee, tea and some fiber supplements. The best food sources of non heme iron are spices, pumpkin seeds, sesame seeds, sun dried tomatoes, natto, baked potatoes and sunflower seeds. Calcium inhibits both heme and non heme iron absorption, if you have low iron I would not avoid calcium in food (reduce excess intake like drinking milk), but I would avoid calcium supplements. If you have osteoporosis and you have to supplement with calcium do it away from iron rich foods or iron supplementation. Eggs contain a compound called phosvitin that impairs absorption of iron. One boiled egg can reduce the absorption of iron in a meal by 28%, eggs however contain many beneficial nutrients and I would only limit eggs (or eat separately to iron rich foods) if you are diagnosed with iron deficiency. Oxalic Acid found in spinach, kale, beets, nuts, chocolate and tea reduce the absorption on non heme iron. So while kale and spinach have good amounts of iron, it is poorly absorbed because of the oxalates. Polyphenols found in cocoa, coffee, black tea, herbs and berries also inhibit non heme iron from plant foods. Polyphenols also have many health benefits so I would not be avoiding these foods unless you are a vegetarian who is low in iron. Zinc supplements, especially high doses of zinc over a long period of time can reduce iron absorption, if you need to take zinc supplements they are best taken away from other supplements, and away from food. Beta-carotene significantly increases iron absorption, it can even cancel out the inhibitory affect of tannins and phytates in foods. Carrots are a good source of beta-carotene. Betaine HCL is the acid that is present in the stomach and it helps with the breakdown of food and absorption of nutrients. Alcohol increases iron absorption, especially red wine in moderation. 2/ Address underlying cause, this may include improving hormones to reduce heavy periods, improving digestion function or reviewing your medications. 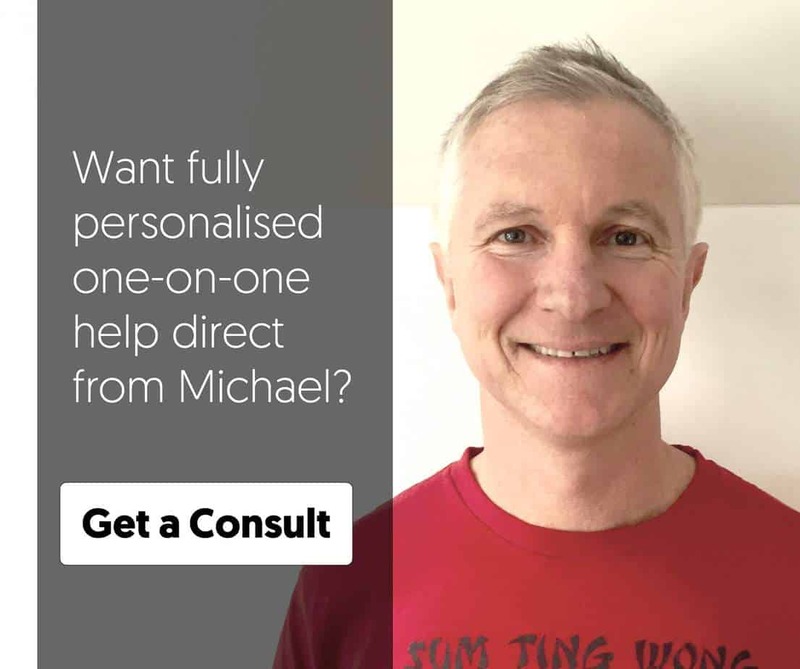 Great article Michael. You mentioned dysmenorrhea being excessively heavy periods but that’s actually menorrhagiathat you mean. Dysmenorrhea is painful periods.